This Hotel Has Meena Bazaar, Hauz Khas & 399 More Delhi-Themed Rooms! 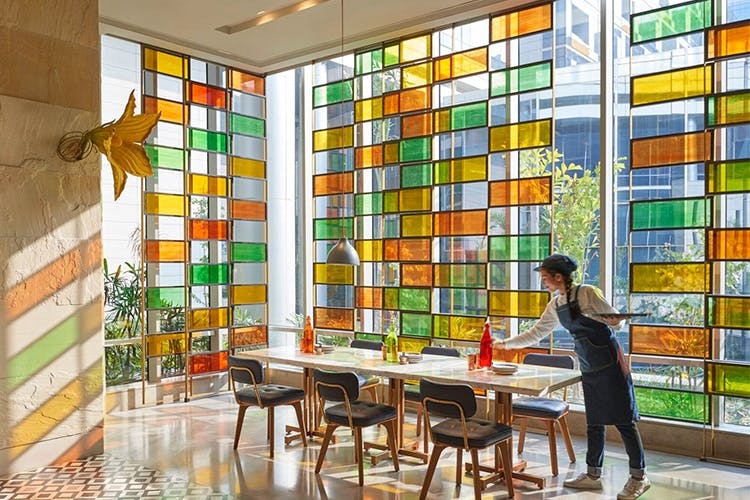 In a sea of sharp, immaculate hotels, Andaz Delhi is a sharp immaculate hotel riddled with colour, character and art that wins for its complete dedication completely to a love for the city. We’re also fans of their fabulous foodhall-style restaurant and their unique take on an upscale club. The entire ideology behind Andaz is that it’s a giant, breathing ode to Delhi. From the riptide of kitschy art splayed against the walls and hanging from the ceilings, to the very-Delhi colours you see in small clearings amidst the vast aerocity-esque white walls, the hotel is an homage to the capital. If your cloaked passion for art wants nourishment, the artwork at Andaz will provide it. From stunning, 7-layer installations by the artists of Kashmir (suspended from the ceiling all the way down multiple floors) to The Memory Book, created by an artist couple with their unfoldable representations of the city, the hotel is bursting at the seams with intrinsically Delhi-laced artwork. The rooms, while being plush, comfortable and up to standard, are also each dedicated to a classic Delhi space or locale. While the theme is not overt, little knick-knacks around the room will tip you off about what part of the city your room is an ode to. Eating here is great if you're two very distinct styles of dining and food - a stylish, lunch hall format with delectable Indo-European food, or a swanky club-like setting with authentic urban Chinese food. The European-style food hall, Anna Maya, is great if you're in the mood for continental food with fabulous flavours. The baked butter garlic prawns and their take on the chicken tikka make for great starters, as does the Amritsari Goat Milk Paneer Tikka. For mains, go with the lovely lamb chops or Delhi's Original Butter Chicken. End with a dessert of Pecan Pie, Blueberry Cheesecake, or one of their lovely gelatos and homey toppings (like stewed apples). If you're in for a more drinks-dinner evening that has a club kinda feeling, cross the hotel space to the isolated Hong Kong Club, a smart, chic space with lovely, rotating live musician sets, a dimly-lit (but not dingy) aesthetic and a cocktail for the year you were born (year of the horse, year of the dragon...). The crystal prawn dimsum, Hong Kong duck mini bao and pork lion really stand out here. What sets Andaz apart from your average hotel is their ability to curate unique, Delhi experiences for you. Whether you want to do a calligraphy workshop or aqua yoga, or get in a daytrip to Fatehpuri Masjid, Bangla Sahib Gurudwara, India Gate and more iconic spots - they're all for organising and customising trips for you to get a full-on, Dilli-style experience. If you're looking for a hotel that's more than purely clinical great service and white walls, Andaz is right up your street.